From a family summer home to an American film set! Il Limoneto degli Angeli offers its guests an ancient eighteenth-century tenement, modernly renovated, equipped with an enchanting lemon garden, with a panoramic view of the town of Minori and the Mediterranean Sea. The interiors are furnished with artistic Vietri majolica floors, and are equipped with all the necessary comforts for a relaxing stay. Our beloved garden is home to timeless calm, authentic scents and the magic of the Amalfi Coast thanks to its renowned lemons cultivated with love and dedication by our family for 20 years. Sitting and relaxing in the garden, pampered by the silence of nature and the evocative panorama, will be for our guests a pure and authentic way to fully enjoy their Amalfi experience. In March 2019 we dealt with a group of "special" guests, welcoming an entire film crew that chose the Limoneto as a set in which to set the film "In Keaton's lemon garden". This ambitious project, centered on a tormented love story between two different cultures in the shadow of our lemons, will be nominated for 2 of the most important independent overseas festivals! Il Limoneto can be reached on foot in just a few minutes from the town center. On the Minori seafront there is the main bus stop and the port where the ferries leave: our guests can explore the whole Coast by land and by sea! Public transport is also well connected with Sorrento, Salerno, Naples and Pompeii. The entrance road to Limoneto is located at a local panoramic bus / shuttle stop in service for the whole day. Minori is a strategic choice for a stay on the Amalfi Coast: it is in its full center and retains the charm of authenticity not contaminated by tourist overcrowding. Small and picturesque, it is also renowned as the "City of Taste" for the excellence of catering and local gastronomic proposals. A lovely and special experience. Beautiful place to stay with wonderful people. Thank you! A few friends and I (there were five of us total) stayed here for a weekend in June while studying abroad in Rome. The owners were very friendly, and even drove us from the bus stop to the house. The house itself affords great views over the ocean and the surrounding mountains, and is a ten minute walk from the beach. In order to reach the house, you have to climb a lot of stairs, but I felt that the stairs actually added to the character of the place; it felt like you were walking down a secret path to a little slice of heaven. However, by far the best feature of the house is the lemon garden, which is reminiscent of a fairy tale. 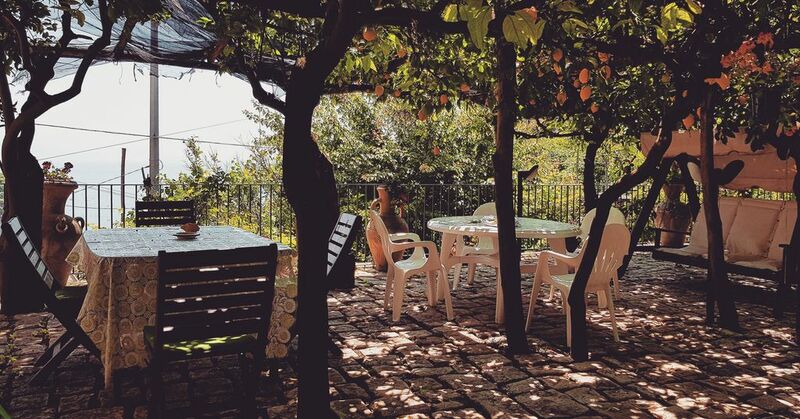 The entire thing is incredibly peaceful and charming, and I would readily recommend this house to anyone looking for the perfect idyllic Amalfi getaway. Nous avons passé seulement deux jours dans la maison de Mario, tjs aux petits soins, c'était exceptionnel!! Le jardin est fabuleux et la maison pleine de charme. Très bien relié par le bus aux autres villages de la côte. Wir hatten in der Unterkunft eine sehr schöne Zeit im beginnenden Herbst. Unser Gastgeber Mario war sehr hilfreich, das begann schon bei unserer Ankunft in Minori. Später haben wir des öfteren sein Angebot genutzt, uns per WhatsApp Informationen zukommen zu lassen. Die Wohnung ist mitten im Ort gelegen, in wenigen Minuten ist man an der Küste mit Strand, kleinen Läden und Gastronomie. Wir sind zu Fuß über Treppenwege (die heißen so, weil sie tatsächlich hauptsächlich aus Treppenstufen bestehen ...) nach Ravello und Amalfi gewandert. Das ist etwas anstrengend, aber sehr schön. Von Minori aus kann man mit öffentlichen Verkehrsmitteln (Bus oder Schiff) an alle interessanten Orte an der Amalfiküste gelangen, auch Pompeji, Capri und Neapel sind gut möglich. Wir hatten zwar einen Mietwagen gebucht, haben den aber wenig genutzt. In Minori gibt es praktisch keine Parkmöglichkeiten. Daher haben Marios Angebot genutzt, einen Parkplatz bei Nachbarn zu mieten. Das war absolut sinnvoll und ist unbedingt zu empfehlen. Man allerdings mit den zusätzlichen Kosten rechnen, die nicht ganz unerheblich sind. Auch in den anderen Orten an der Amalfiküste und erst recht in Neapel gibt es selbst außerhalb der Hauptsaison praktisch keine Parkmöglichkeiten. Die Wohnung selbst war sehr sorgfältig eingerichtet und war für uns (3 Personen) sehr gut ausreichend. Der Außenbereich besteht aus einem Zitronenhain und ist schön. Der gesamte Bereich ist beschattet, was im Sommer bestimmt besonders wertvoll ist. Im Außenbereich gibt es auch eine Dusche, die wir auch regelmäßig benutzt haben. Die Dusche im Bad mit Duschvorhang war allerdings auch nicht so wirklich einladend, zumal das Duschen dort wegen des Duschkopfes auch immer mit Haarewaschen verbunden war. Zu unserer Abreise wurden wir von Marios Eltern sehr herzlich mit Espresso und Kuchen verabschiedet, wir haben uns sehr gefreut, die beiden kennenzulernen. Insgesamt hatten wir eine sehr schöne Zeit in der Ferienwohnung, vielen Dank an Mario! Abbiamo soggiornato per tre notti in questo bellissimo e caratteristico appartamento. Nulla di più bello è avere a disposizione un'intera limonaia attrezzata con tavolo e sedie dove poter godere della vera atmosfera della Costiera e della bella vista sul mare e sul paese di Minori. L'interno dell'appartamento è spazioso, pulito e ben arredato. Bellissimo il pavimento di piastrelle tipiche della zona con sgargianti colori che danno allegria. La cucina è ben fornita di tutto per poter cucinare (pentole, piatti ecc. pasta/pomodoro), condire (olio/aceto/sale/pepe) e fare una colazione (biscotti/thè/caffè/zucchero) ecc. La famiglia Santonicola è molto gentile, cordiale ed anche veloce e precisa nelle comunicazioni dalla prenotazione al vostro arrivo. La casa si trova a 5/7' minuti dal centro di Minori. Si raggiunge a piedi seguendo le scale che salgono verso Ravello, ma si può arrivare anche abbastanza vicino con l'auto e poi a piedi 3' di scale. Noi abbiamo prenotato il parcheggio da un vicino (€15 al g) e l'auto l'abbiamo ripresa alla partenza. A 5' c'è in paese la fermata del Bus che è il modo migliore per visitare la Costiera. Grazie ancora di tutto e speriamo di poter tornare!